With some products as soon as I see them start popping up on blogs I know straight away that I want to give them a try. This actually wasn't one of those products, to be honest I wasn't really that interested in it. 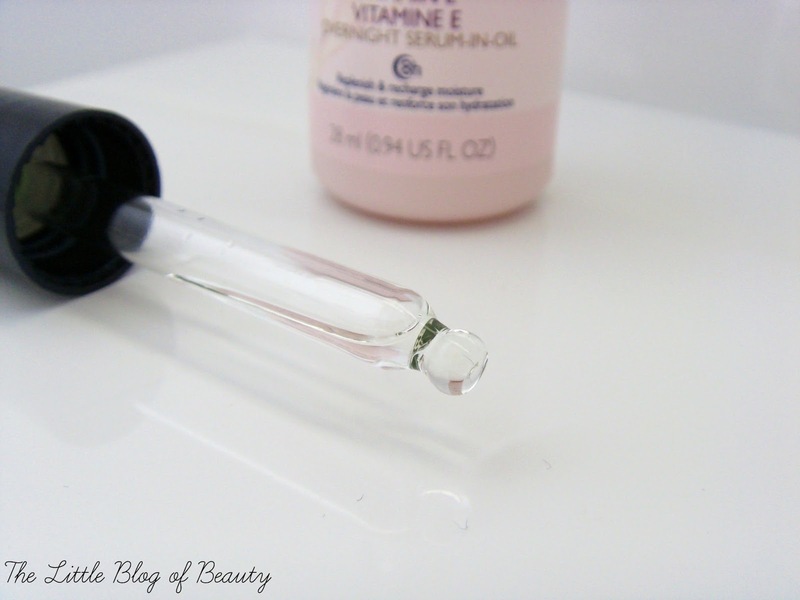 Although I've been using facial oils for a while now, as I said in my recent empties post, I'm actually quite new to serums, so maybe that's why this one didn't instantly make it to my wish list. Browsing round The Body Shop one day I knew I wanted to try the Camomile Silky cleansing oil (review here) and as they had an offer on skincare for buy one get one half price I thought I'd give this a try as I found myself drawn to it in store. The serum-in-oil comes in a simple little bottle that has a screw off lid with an attached dropper and this contains 28ml of product. At first I thought the packaging was plastic but after having just given it a little tap with my nail I think it may be covered glass. I believe this is the first two in one serum and oil product and I wasn't sure what this would be like. I would describe it as a slightly oily water type consistency, it's thinner than a serum and also thinner than other facial oils I've tried. It's a little on the slippery slide if you drop this on your finger so you need to keep your fingers together or maybe drop it into the palm of your hand instead. I find this to have a quite light but very luxurious smell to it and looking at the ingredients there are several fragrance ones in there including parfum. The Body Shop describe this as 8 hours beauty sleep for your skin that recharges, replenishes and softens leaving skin looking fresher, more rested and radiant. Vitamin E is supposed to protect your skin from the damaging effects of the environment such as pollution, cigarette smoke and UVA/UVB rays and also from premature ageing. The premature ageing part sounds great for an overnight product but I don't think you have to worry too much about pollution, smoke and the suns rays while your sleeping. When I first started using this I used two drops for my whole face but since this warm humid weather has been around for a while now my skin has switched from dry more towards normal, so recently I've only been using one drop. This massages into the skin nicely and absorbs within a couple of minutes leaving behind lovely soft skin. If my skin was currently still very dry I would definitely use a moisturiser over the top but at the moment most nights this is enough for me, so I'm only applying a moisturiser over the top every few days for a little boost. For some reason my skin never seems to look naturally radiant no matter what skincare products I use but using this I do wake up to soft, refreshed skin that looks about as radiant as my skin gets. I'm really enjoying using this product, you use the tiniest amount so the bottle will last forever (maybe a slight exaggeration!) and obviously as it's two products in one it's a lazy girls skincare dream (not that I'm saying I'm lazy, but we all have our moments don't we! ), especially if you can skip using a moisturiser afterwards. 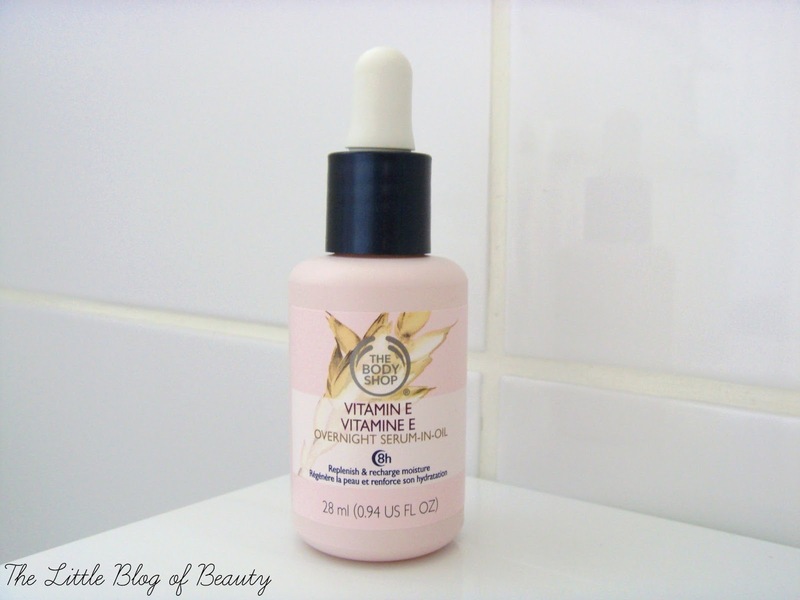 The Body Shop Vitamin E Overnight Serum-in-oil is £12 and is available from The Body Shop website and in store. Until 9am on the 5th August The Body Shop have 35% off online using code 35OFF, so you can grab this for just £7.80. Would you use a two in one product like this?